Browse our collection of 1 Equestrian Gifts Sticker/Decal Sheets and more. Designed and printed in the USA. 100% Satisfaction Guaranteed. About this Design Ho Ho Ho America! 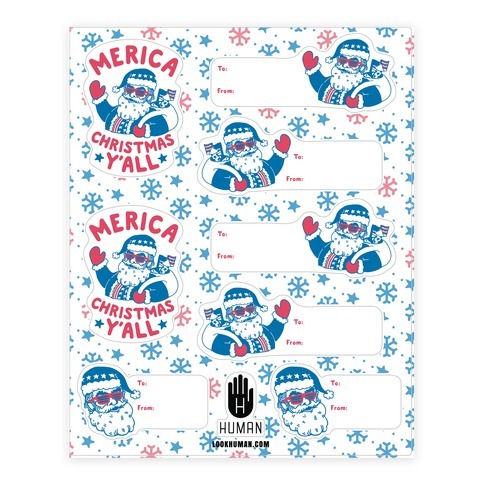 Wrap some presents, sing some carols, drink some eggnog, and spread the holiday spirit and your red white and blue love of the beautiful USA with these 'Merica Christmas gift tags featuring Santa Claus decked out in patriotic gear! These gift tags are perfect labels for people who love Christmas almost as much as they love truth, justice, and the American way! 'Merica! Ho Ho Ho America! Wrap some presents, sing some carols, drink some eggnog, and spread the holiday spirit and your red white and blue love of the beautiful USA with these 'Merica Christmas gift tags featuring Santa Claus decked out in patriotic gear! These gift tags are perfect labels for people who love Christmas almost as much as they love truth, justice, and the American way! 'Merica!